Kathryn M. Tinkler, 87, a resident of the Lakes at Willow Valley was called to her eternal home by her Lord and Savior on Saturday, January 19, 2019. She was the loving wife to the late Frederick J. Tinkler, Jr. who passed in 2010. Born in Bethlehem, PA she was the daughter of the late Harold Lebo and Florence (Dinger) Lebo. Kay became a Registered Nurse after studying at Abington Memorial Hospital. She retired from Montgomery Surgical Associates in the early 1990’s. Kay was a member of Calvary church previously she was a member of Limerick Chapel in Limerick, PA, where she was active in the choir. Kay was strong in her faith and enjoyed teaching Bible Club. She enjoyed cross-stitch, gardening and traveling with friends and family. Kay will be remembered for her kindness and gentleness as well as her love for the Lord, her family and friends. Kathryn is survived by her two daughters, Carol L. wife of Herb Taylor of Elizabethtown, and Sharon J. wife of George Reede of Reistertown, MD; a son, Frederick J., III husband of Helene Tinkler of Broken Arrow, OK; nine grandchildren; a brother Robert Lebo, husband of Virginia of Willow Valley and several nieces and nephews. She is preceded in death by a sister Jean (Paul) Hughes; a sister-in-law Shirley (Truxton “Pete”) Musselman. A Memorial Service will be held on Friday, January 25, 2019 at 11:30AM. at The Lakes at Willow Valley, 300 Willow Valley Lakes Drive, Willow Street, PA 17584. Friends may greet the family prior to the service from 11AM to the time of service. Interment will be private in the Indiantown Gap National Cemetery. 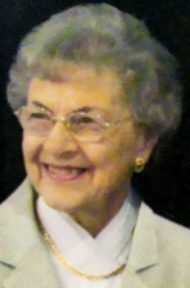 In lieu of flowers, contributions in her memory may be made to The Educational Fund at Willow Valley, 600 Willow Valley Square, Lancaster, PA 17602. To Carol, Sharon and Fred – We are sorry to miss the memorial service of your mother. We had hoped to bring our parents, Ted and AnnaMae, but they thought it would be too much for them. We have so many memories of your parents and know that our parents counted yours as some of their dearest friends. What a reunion that will be when they all are together in heaven! Kay was truly a good and faithful servant of our Lord Jesus Christ. Well done! We are very sorry to hear about your Mothers passing. Our prayers and thoughts are with you and your families. I worked with Kay at MSA for many years.